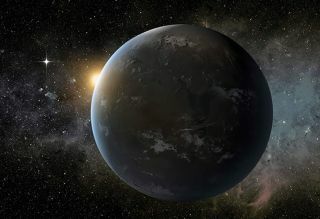 Artist's illustration of a possibly habitable exoplanet. One of the closest rocky planets to Earth could have a wild climate that oscillates quickly between hot and cool periods, a new study reports. This planet, known as Wolf 1061c, resides in the "habitable zone" of its host star, that just-right range of distances where liquid water could theoretically exist on a world's surface. But it's far from clear if Wolf 1061c could actually support life as we know it, study team members said. Venus likely had oceans on its surface in the past, but was so close to the sun that the heat made all the oceans evaporate. The water vapor assisted in trapping heat, contributing to Venus' runaway greenhouse effect. Something similar may have happened on Wolf 1061c, said the new study's lead author, Stephen Kane, of San Francisco State University. Wolf 1061c is "close enough to the star where it's looking suspiciously like a runaway greenhouse," Kane said in a statement. "The Wolf 1061 system is important because it is so close [to Earth], and that gives other opportunities to do follow-up studies to see if it does indeed have life," Kane said. The team found that Wolf 1061c's orbit varies at a faster rate than that of Earth, and this likely leads to greater climatic variations than Earth experiences. "It could cause the frequency of the planet freezing over or heating up to be quite severe," Kane said. So it's unknown whether or not Wolf 1061c actually is habitable, study team members said. Getting to the bottom of this question may require more-advanced telescopes than are currently in operation, the researchers added. One future instrument that should help is NASA's $8.8 billion James Webb Space Telescope, which is scheduled to launch in late 2018 and succeed the Hubble Space Telescope, Kane said. Webb is expected to reveal the composition of nearby exoplanet atmospheres in detail. Findings from the new study will appear in the next issue of the Astrophysical Journal. A preprint version is available now on the website arXiv.